Tom Hardy Pursued For The Role Of Elton John In The Musical Fantasy Biopic ROCKETMAN? It's early days in the casting process on ROCKETMAN, the "biographical musical fantasy" about the life and music of Elton John, but it sounds like the filmmakers are taking an unexpected approach to the portrayal of the legendary musician. 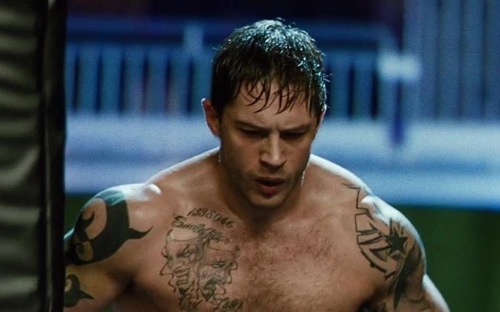 I mean, if you were to ask me to list ten actors who could play Elton John, I would never, ever think of Tom Hardy. According to HitFix's Drew McWeeny, however, he's someone John and director Michael Gracey are seriously considering at this point. Right now, they're merely guaging interest: there's no formal offer on the table, and I'm pretty sure Hardy's not the only actor being courted. But the fact that they'd go in this direction suggests that they're more concerned with the performance than the singing (I tried to find footage of Hardy crooning, and what little evidence there is does not make a solid case for his skills in this department). Do they feel Hardy could be trained to sing like Elton, or is the pop icon planning to sing the songs himself? The one downside to the latter option is that Elton's voice dipped from tenor to baritone after he had throat surgery in the mid '80s; it'd be nice to hear a performer with Elton's old range take on his classic '70s work. I'm certainly intrigued by the notion of Hardy playing Elton John. Though he's best known for his portrayals of various tough guys, he's also demonstrated real versatility. Who's to say he can't pull this off?